Media & Democracy at Lindholmen Science Park has just published a new report. 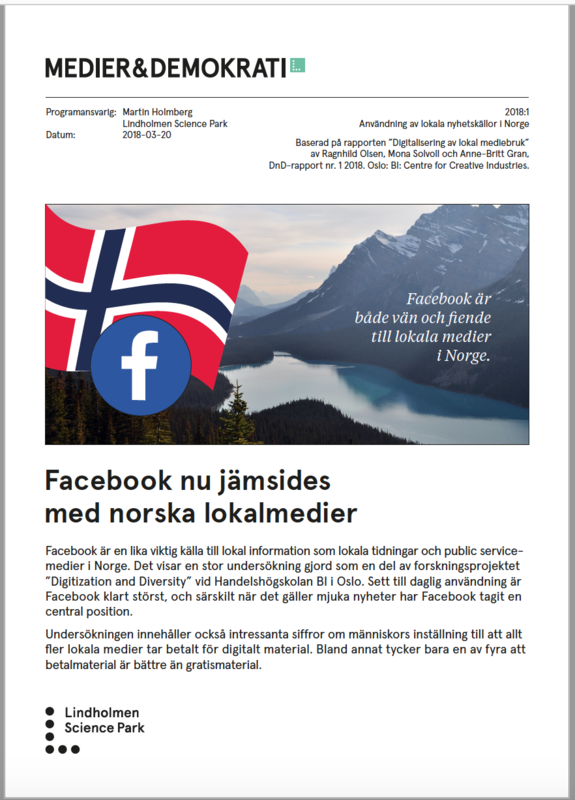 The report focuses on local media consumption in Norway, where a new study by the BI Norwegian Business School in Oslo found that Facebook has, in a short period of time, become as important a source for local information as local newspapers and public service media. The report shows how the global media giant, which is currently the focus of much attention, has taken a place in people’s everyday lives. Almost 80% of citizens in Norway say they use Facebook to find out what is happening where they live. This figure was taken from a major survey carried out as part of the “Digitization and Diversity” research project at the BI Norwegian Business School in Oslo. The result of the project, “Digitalisering av lokal mediebruk” [Digitization of local media usage] (DnD report no. 1 2018, Oslo:BI: Centre for Creative Industries), was presented last week. Media & Democracy has read the report and produced a summarized version in Swedish. “Our report contributes to a better understanding of the digital transformation that is underway for local media. These no longer have a unique position, as Facebook is now one of the most popular channels to find out about the latest news in the local community,” says Ragnhild K Olsen, one of the researchers behind the report. The other two researchers are Mona Solvoll and Anne-Britt Gran. The Norwegian survey also found that local media are facing a substantial challenge when they try to charge for digital content. Only one in four consider paid content to be better than free material. “Our survey shows the key challenges facing local newspapers when they redesign their business models and begin charging users online,” says Ragnhild K Olsen. Media & Democracy’s reports have to date been distributed to the program’s target group and partners. However, the reports will soon be available for download from our website.